The online world is abuzz with discussion about business models thanks to the continued proliferation of Alex Osterwalder’s book, Business Model Generation, so much so that the very necessity of a business plan has come into question. In previous blogs, we have discussed the basics of business models and business plans, but today we want to directly parallel and compare the two, and discuss the key differences, where they integrate, and why we believe it is important to have both. There is a lot of attention being devoted to the creation of startup companies, as many determined individuals endeavor to create a system that will increase the odds of success associated with building new ventures. Currently, the two leading theories, at least in the online world, relate to customer development and business model generation, and represent a shift away from a lot of the traditional ways of thinking about building a business. In the traditional way, an entrepreneur would take an idea, write a business plan and try to get funding from investors. Clearly this method of doing things is still very common, but it has come under fire from many different people, especially in the startup technology sector. A couple of individuals who are against the traditional notion of a business plan are Steve Blank and Alex Osterwalder, the men behind the customer development and business model generation theories respectively. Since the debate is getting interesting, let’s put the two into context. Sketching out a business model is a great way to create a broad-strokes overview of the business. 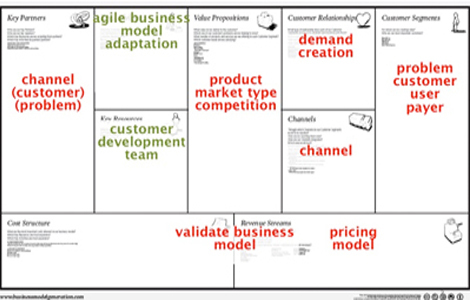 While a business model is the outline, the business plan is the fine details. It delves into the finer points of the business to describe in specific detail what the company’s strategy is and how it will execute that strategy (among other things). The major difference between a business plan and business model is that a business model is essentially a concept, something that can be sketched out on a piece of paper and articulated in a few minutes. A business plan, on the other hand, is typically a lengthy document that contains multiple sections and goes into the fine print to discuss the business. No business can exist without a solid business model, but it is usually the business plan that articulates how the model will be implemented. The reason some are starting to question the very existence of the business plan is because of the perception that the whole plan relies on assumptions that are not yet proven in the marketplace. Steve Blank argues that since a business plan is typically built around a set of knowns, they should not be used for startups who rely on unknowns. Mr. Osterwalder, believes that “no business plan survives the first customer contact.” Instead of a business plan, the two recommend starting with a business model and then using the customer development theories to work with customers, iterate and repeat until a successful model is found. While it is true that theoretically utilizing a combination of a business model and customer development framework will lead to customers, validated assumptions and a proven business model, we believe that to discount the importance of a business plan completely is unwise. A business plan has a lot more importance than detailing the strategy of the company. It also contains core company information (mission, vision, milestones, unique risks), the financials and other important elements that are crucial to communicate internally. If used correctly, a business plan can be cohesive document that binds the company together and puts everyone on the same page. It does not need to be a huge document with 100 pages detailing every small aspect of the business. In its final form, it can be a concise 3 to 5 page summary of the key points that gets updated every month. Also, there is no reason to stick to a specific plan if things are not working out. Staying agile is an essential quality for any business, even if you spend months writing a business plan that becomes obsolete a week after launch. Assumptions can be updated without discarding the whole plan; you certainly don’t want to readjust the direction of the entire business with each change or anomaly that you encounter. Additionally, writing a business plan helps to build foresight and intuition. It is a useful exercise to make assumptions and pull them together to build a long-term outlook for the business, especially for strategic, financial and human resources planning. It’s true that startups are in a race against the clock to prove viability and that it’s virtually impossible to know how things will play out, but it is important to have a strong vision and believe in the company’s long-term success from the outset. Overall, we believe that it is ideal to have both a business plan and business model for your business, as the two integrate perfectly. Create the business model at the outset to ensure that the idea has merit and that there really is a business there. Then, start writing a business plan to outline what the company will look like and how it will attack the opportunity. Make the plan your own by defining objectives and key outcomes from the beginning, and remember to stay out of the ivory tower and get out there. Keep in mind, that to attract investors and high-quality business partners, you are likely to need a business plan regardless of how good the business model is. We have seen many entrepreneurs come to us with good business models, yet no business plan; while things look good initially, it is impossible to assess the direction that the business is going without seeing some details. Few people are going to jump into and commit to something without seeing the long-term planning and in-depth analysis that is usually found in a business plan. In the end, it all depends on your style as an entrepreneur and what type of business you plan on building. For some startups, like a small tech company building a new software product, a business plan may not be as important, but for bigger projects, like a renewable energy company, business plans are essential. There are no silver bullets in the startup world, so use your own intuition and choose the strategy that works best for you. Whether you build a business model, write a business plan or decide to skip these steps and just get in there, it’s all a learning process that leads to very worthwhile experiences.